Amidst all the speculation, there was a studied silence from his peers who had witnessed Newshour sit at the top for eight straight years. The bespectacled enfant terrible had emerged to unsettle the smug club. After all, don’t we die a little when a friend succeeds? Moreover, the reality of a cut throat media is that your success is not as important as the failure of others. Anyway, paeans have been written about Arnab and his style of journalism. The question is, what exactly drives this sort of noisy tele-tyranny? While I’m a news junkie, I don’t like shouting. And I don’t like being shouted at. And yet, I have to admit that I am tempted to catch glimpses of Newshour. Note that ‘glimpses’ is the key word, okay? Those who watch the entire show have nerves of steel. Erm, rather ears of steel. So why do I watch a raucous show? Perhaps, because Arnab asks questions that no other news anchor dares to. Perhaps because watching Newshour is like watching an intellectual Big Boss. In fact there are multiple drivers. Recently, I was presented with a Twitter poll - do you watch news because you want to know what’s happening or do you watch news for entertainment? An overwhelming number voted for news as infotainment. Is it any surprise then that Wrestlemania trumps all? Rewind to 1998 when Arnab Goswami presented Newshour on NDTV, he was a pale shadow of his current thundering typhoon persona. His popularity grew when he joined Times Now in 2006. So I’m not sure if his power comes from the Times Group or his verbal pyrotechnics, or both, but what I know is that power does different things to different people. In case of Arnab, it brought out the love for his own voice. And the masses loved it. Much like Chetan Bhagat’s novels, Arnab’s Newshour catered to a new demographic that sneered at the privileged. Given that the product had become bigger than the brand, the wise had seen his resignation coming. This brings me to what Vinod Mehta wrote, “When I began my career, our mandate was to bring sunlight to the wrongdoing. Once that was done, other democratic institutions would take over the baton. ‘Activism’ was a dirty word in our lexicon. Now it is a virtue, indeed a necessity. Ironically, some of our anchors who hurl fire and brimstone from Monday to Friday are the gentlest creatures off the screen. They shed their pugnacity and become normal immediately after the show." So this fire breathing dragon-esque demeanor is all a pretense. Moreover, unlike his NDTV colleagues who belong to an erstwhile privileged club but were scarred by controversies (Radia tapes and cash for vote scam) Arnab continues to wear a nationalistic halo. So when he plays dinner time orchestra, pulls the harps, bangs the drums and blows his trumpet, it sounds like symphony to his viewers. Whether it is the bashing of Pakistani guests, sneering at Bollywood’s cocktail circuit or milking the common man’s outrage, the fireworks ensure spectacular viewing. While the elite criticize his jingoist pounding and narrow identity journalism, his contemptuous questioning of the powerful empowers the common man. 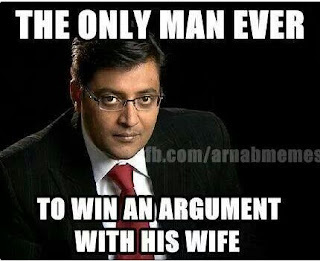 As for me, the one thing that unnerves me about Arnab is that he comes with a notion that he is always right. So where is the scope for debate? Anyway, given the political agenda of news channels, television debates complicate issues instead of resolving them. And it’s not that the future of democracy depends on the outcome of these debates, right? The truth is that viewers get what they want and not what Arnab wants. He knows that infotainment is a shared joy because there is no Arnab without the viewer and, of course, there is no viewer without Arnab. Since TRP is the only moral, inherent drama and riveting action make for compulsive viewing. But hang on. While I contemplate peaceful dinner nights here on, I see Arnab judging wrestle mania, jerking his gelled hair and nudging the two politicians to gorge out each other’s eyes. Was the ‘I quit’ bomb a damp squib? All bluster? After all, our man from Assam, the son of a retired Colonel is known to have the last word, right? Even if he moves on, he will ensure that he has the last word. That is a given. 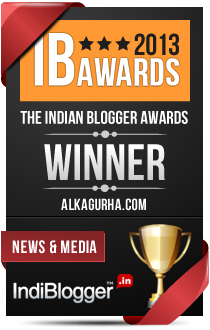 In his farewell speech, Arnab is seen as saying, “The game has just begun.” Well, bring it on. It is not Arnab who loves infotainment. It is the viewer. I've loved and hated Arnab. I like that he has the guys to ask the tough questions but l hate the noise. I've rarely watched News hour but then l hardly watch any Indian news channel. I am sure his new channel will give heartburn to all competitors. He was bigger than Times Now. The man has a huge following and is a refreshing change from his other colleagues. He will be bigger and larger. Also I saw his shoot with AIB (Tanmay Bhatt) and I realized there is a lot more to this man than just that News Hour. And also the way he stood up for one of his journalist to who some big politician had said something bad (dont remember the exact details anymore)... He is much better than his competitors! He will be missed for sure! Don't worry. He'll be back in a nastier, even more righteous avatar. I miss those days when we watched news for knowledge and information. These days its just a cacophony of accusations. when arnab started the show on times now,he was really sensible and people liked him.but within short period he has lost his mind and became psychotic for TRPs. he is like a speaker of ruling party who gives least time to opposition party.so you have two groups on his show,people who support arnab and people with other opinions. he is really psychotic and won't allow people to speak and bashing pakistan all the time brought sympathy for pakistan among indian viewers.he is raj thackeray of media. worst thing is that he has influenced his fellow newsmen with his antics on other channels too and you find everyone shouting at people without allowing second person's opinion. i find rajdeep sardesai and rahul kanwal better to watch news. i have stopped watching arnab goswami very long back,he is just dumb,deaf and stupid. though rajdeep and rahul too exceed limits sometimes,they are not as psychotic as arnab. even if arnab comes with a new news channel,it will be for junkies and pseudo intellectuals.i think india today is only news channel in india where people can bear debates and news. how rajdeep became famous with his debates? he used to say," we are not like arnab times now and we don't allow two people to speak at a time". so sensible things will get patronage from intellectuals all the time. This is exactly why I like him. Yes, he's pugnacious and loud. But I admire his guts. I stopped watching Arnab longtime back.But his selection of topics shows some hidden hand I wish I have read this post earlier. It is only yesterday one of the greatest (according to me0 media journalists )Mr. Girish Nikam passed away and his "Big picture" was a much watch programme for me and I started believing even Government Media could be impartial He has many followers amongst the oldies in my group. I think the young see through the game. The Drama Queen of Indian Journalism. Salvaged some honour, of late, by taking seemingly patriotic stands. His shows should come with some kind of warning not to follow his style (as they do for showing dangerous stunts). But already his style has become infectious as I see some guys in regional channels emulating his style. Ethically speaking, it is a violation of one of the basic principles of journalism when the journalist makes himself the centre of attraction making others to fade into the background. Of course someone somewhere has said, "Every journalist is a failed politician". I never liked his style of journalism but at the end of the day, it all boils down to TRP. Would we blame Arnab for stoking fire in his brand of controversies? Debatable, yes! But, his style of functioning lately was too much toeing the line of the Government. Yes! He boosted prospects of Times Now. You've put forward a very fresh perspective. "In case of Arnab, it brought out the love for his own voice".Very well written. He's entertaining,if it can be called that,but as you said, you need nerves of steel to hear his whole program. His programs always manage to evoke a certain amount of agitation in me. I am sure even if he were not criticising anybody, he would still be having the same decibel level and tone! I liked his drive against VIP culture but it is torture to sit through those fish-market scenes.It will be interesting to see how Newshour shapes after he leaves. I love that he asks questions. He does that to everyone. And he does it every time. About having an opinion, I feel it is better to display it in open than covering it and pushing it under cover. I am an applauder of Mr Arnab Schwarzenegger's pyrotechnics. When faced with the sidekicks and spokespersons of venomous serpents like A Kejriwal, R Gandhi, L Yadav, M S Yadav, A Yadav, M Banerjee, Mayawati, S Yechuri et al., the lone Anti-Venom-Serum that can summon any semblance of balance is the man you have ridiculed. Sometimes, nothing but poison can stall poison.